When the U.S. House of Representatives issued its first Mother’s Day resolution in 1913, it called on all federal government officials to wear a “white carnation or some other white flower” to honor the nation’s moms. But even before the Congressional proclamation of an official day, mothers have been celebrated with flowers. Today, more Americans search for “flowers” around Mother’s Day than Valentine’s Day, according to Google Trends data for the last 10 years. 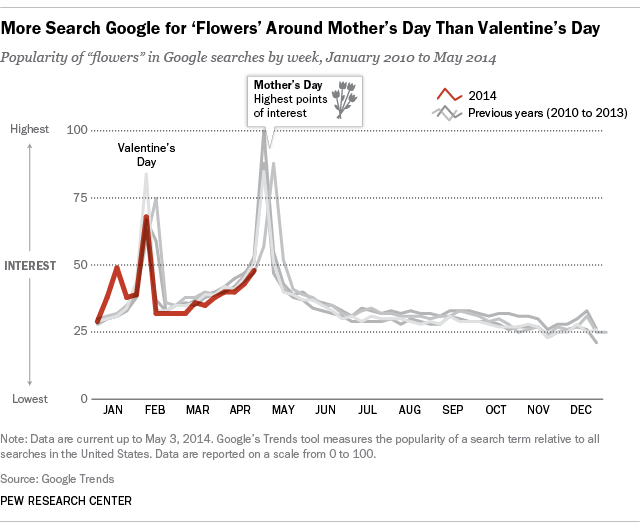 While the volume of searches for “flowers” in the United States are stable through most of the year, searches peak on the Friday before Mother’s Day and on Valentine’s Day. Google’s Trends tool measures the popularity of a search term relative to all searches in the United States. Data are reported on a scale from 0 to 100. Noble Kuriakose is a Research Analyst at the Pew Research Center's Religion & Public Life Project. Jessica Schillinger is a former Information Graphics Designer at the Pew Research Center.